Sober Look: The ECB lending to periphery governments via "backdoor SMP"
The ECB lending to periphery governments via "backdoor SMP"
The ECB had been a big disappointment for the periphery governments. These nations have been asking the central bank to help support their government bond prices by continuing and expanding the Securities Markets Program (SMP) to directly purchase their government debt. But the ECB, particularly the German contingent, wanted none of that. And so the program was stopped. Reuters: The European Central Bank kept its bond purchase programme dormant for the seventh week in a row this week, despite increasing unease in financial markets about the situation in Spain. 1. Banks would issue bonds and retain them (a bank would effectively lend to itself). 2. The government would slap a guarantee on those bonds (after all it doesn't directly cost the government anything for this guarantee). 3. The banks would then post their own bonds with the ECB, who accepted them as collateral because of the government guarantee. Using these bonds as collateral the banks would borrow under the LTRO program. 4. With this new LTRO cash the banks would buy Italian government paper, which they also posted as collateral to borrow more or would hold the paper in reserve to meet margin calls. Barclays Capital: - Data show that €105bn of governments securities (29%) have been used in the ECB collateral pool as of the end of March, with €98bn still available for additional funding. We note that, as of August 2011, only €18bn were used in the ECB collateral pool (with €57bn available for additional collateral). 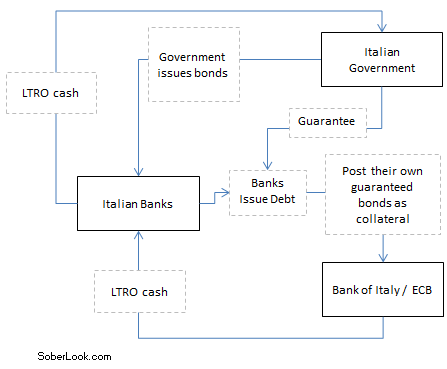 The end result was that the Italian government ended up with the LTRO cash and the ECB got stuck with government risk on its balance sheet for 3 years. To put it another way, the ECB was not lending to the government directly. Instead it was lending to a government guaranteed entity (the bank), who in turn was lending to the government. Hard to believe, right? Here is the data. 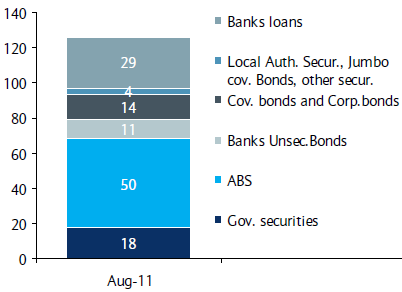 Below is the breakdown of the collateral posted by all Italian banks with the ECB in August 2011. And here is the collateral held by these banks with the ECB last month. Note that the scale on the two charts is completely different as banks' balance sheets have ballooned during this period. 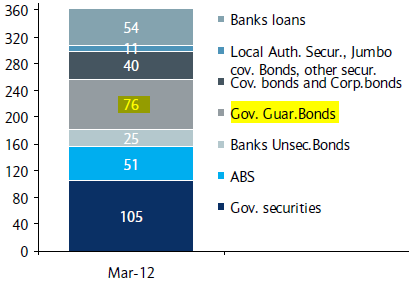 And here we have the €76bn of government guaranteed bonds posted as collateral. In addition there is €25bn of unsecured bonds that are not guaranteed but somehow "qualified" as collateral (discussed here back in January). Italian banks also posted a great deal more corporate loans and corporate bonds they held on their balance sheet. We've seen the use of government guaranteed bonds as collateral before in the case of Portugal. But this is on a whole new scale. Barclays Capital: - Most of the government guaranteed bonds have been issued and retained by banks for the sole purpose of creating collateral to access the ECB. According to Borsa Italiana (Italian Stock exchange) data, 14 Italian banks issued a total of €40.4bn of government guaranteed banks bonds on the day before the first 3y operation in December, and in total, at the end of March, the issuance amounted to €87bn (with a collateral value of €77bn net of haircuts), with many small and medium sized banks issuing bonds of a small size (note that the amount issued by the five main banking groups amount to €49bn). Most of the bonds issued for the first 3y LTRO were with short maturities and were subsequently replaced by longer maturity bonds (issuance in 2012 has been under the new, cheaper, guarantee scheme, which entered into force on 1 January 2012). At the end of March, the Government guaranteed bank bonds represented around 21% of the total collateral pool pledged by Italian banks. And of course this resulted in a massive purchase of Italian government debt using new LTRO funds (as discussed earlier). The periphery governments got what they wanted - the ECB indirectly financed their bonds. The issue of course is that this still turned out to be not nearly enough to stabilize periphery yields over the longer term.